MADISON, WI, August 29, 2015 /24-7PressRelease/ — Pro Nutrition Labs, a provider of nutritional supplements, has released their new Her Natural Whey protein powder for women that contains whey from grass fed cows free of recombinant bovine growth hormones (rBGH), and is sweetened naturally. It is widely known that whey protein is one of the best sources of protein for helping build lean muscle. Pro Nutrition Labs has taken it a step further by creating a protein powder that combines pure whey isolate, whey protein concentrate, pure undenatured whey protein, skim milk powder, and whey peptides. In addition, Her Natural Whey has eliminated the use of artificial sweeteners due to new research on the side effects of these sweeteners and the demand in the marketplace for products without artificial sweeteners. Her Natural whey is naturally sweetened from ingredients found in the leaves of the stevia plant. Her Natural Whey protein powder is made of the highest quality protein from grass fed cows free of recombinant bovine growth hormones (rBGH). With 20 grams of quality protein, only 3 grams of carbohydrates and 2 grams of fat it helps people feel fuller, thus supporting the growth of lean muscle tissue and fat loss, while also giving the feeling of increased energy. 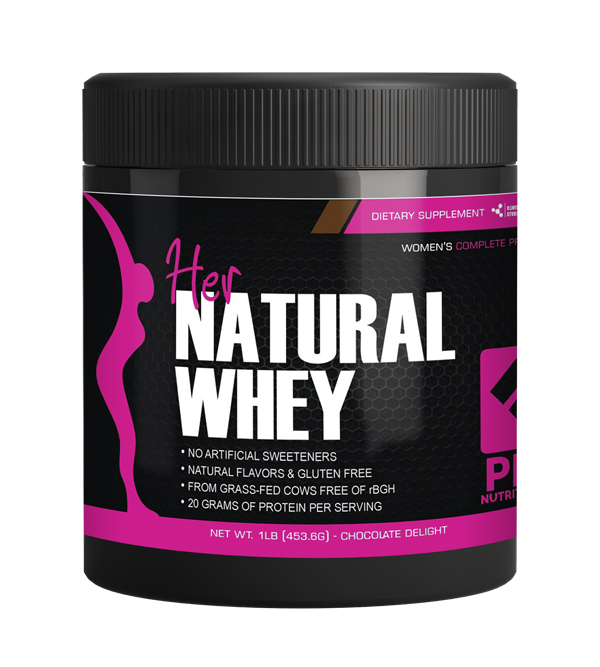 Combined with exercise, Her Natural Whey protein powder for women can help individuals reach their fitness and physique goals, whether that means to decrease body fat, add lean muscle, or both. “I love this protein powder so far. This is the first time I’ve tried it. I love the fact that it’s low in calories and that it doesn’t have a lot of sugar. I put this powder in my yogurt, oatmeal and sometimes I just put it in my milk and it keeps me full for a while due to the large amount of protein it has. I also feel more energized after taking it. I like the fact that it is gluten-free and it’s from grass feed cows. Also, it doesn’t have any artificial sugars which is a plus for me. I would definitely buy this product again”. – Amanda B.